HyperDeck Studio Mini is a miniaturized professional deck that records and plays back broadcast quality 10-bit video using commonly available SD and UHS-II cards. HyperDeck Studio Mini features 6G-SDI for working with all SD, HD and Ultra HD formats up to 2160p30. HyperDeck Studio Mini is unique because it includes HDMI for monitoring, a built in sync generator and ethernet for uploading media via FTP so it also becomes an ideal solution for digital signage tasks. Broadcast quality recording and playback you can take anywhere! 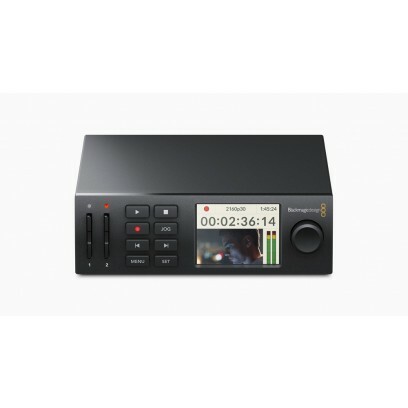 HyperDeck Studio Mini is perfect for use as a master program recorder during live multi camera production, or as an ISO recorder from your cameras so you can edit the final program later. HyperDeck Studio Mini is also a powerful clip player for playback directly to air, or even as a client preview deck in a conference room with a large HDMI television. Because you can lock and sync the playback of multiple units together, it’s ideal for high resolution digital signs that use multiple screens. The separate fill and key SDI outputs let you use it to play animated broadcast graphics with an alpha channel for keying over live video with a live production switcher, all in real time! Incredibly small design with powerful full size deck features! HyperDeck Studio Mini features dual SD card recorders, professional connections, ethernet, built in power and much more, all miniaturized into an elegant 5.5 inch wide compact and modular design. You can rack mount it using the optional Teranex Mini Rack Shelf and combine it additional modules to create a customized deck! For example, if you need to work with analog material, you can combine it with a Teranex Mini Analog to SDI converter on the input and a Teranex Mini SDI to Analog converter on the output to create an analog deck! To create a deck with eight mirrored outputs, use it with a Teranex Mini SDI Distribution 12G. If you're not using it in a rack, HyperDeck Studio Mini’s elegant design also looks great when used on the desktop. It’s the world’s most sd-card professional deck!